Eder Präzisionskamera GmbH was a camera maker in Munich, Germany - active in the 1930s. 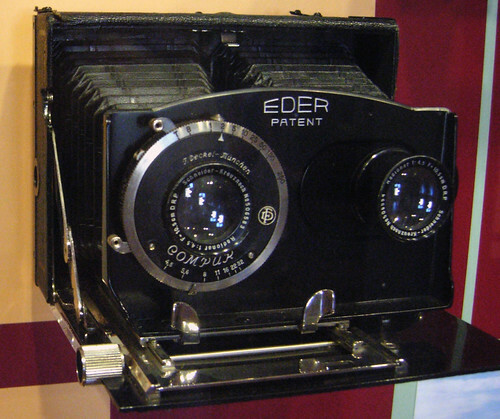 The only well-known model was the Eder Patent-Kamera, c.1933 - an odd "double-barrelled" folding camera with two sets of bellows, one for the taking and one for the viewfinder lens - making it a TLR. This was made in 4.6x6cm, 6x6cm and 6x9cm sizes, and in roll film and plate versions. It was delivered with a Tessar f4.5, Schneider Radionar f4.5 or Xenar f4.5 in a Compur shutter as the camera lens and with an Edar f4.5 Anastigmat or Radionar f4.5 as the finder lens. This page was last edited on 18 September 2013, at 00:31.